EDINBURGH CASTLE (3) was built in 1947 by Harland & Wolff in 1948 with a tonnage of 28705grt, a length of 747ft 4in, a beam of 84ft and a service speed of 22.5 knots. Sister of the Pretoria Castle (2) she was built to replace the lost Warwick Castle (3) and underwent the same refit in 1962. 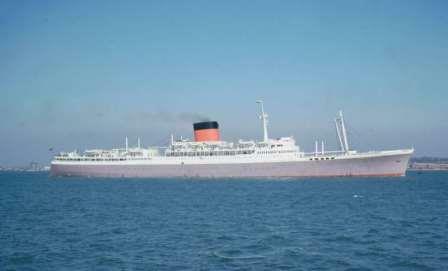 On 5th March 1976 she commenced her last passenger sailing from Southampton before undertaking a one-way cargo only voyage to the Far East where she was broken up at Kaohsiung by Chou's Iron & Steel Co. in the June of that year. In 1945 at the end of hostilities with Germany the Company was faced with having to replace two of the Mail Fleet to replace war losses and very little cash to do it with. To compound the problem shortages of materiel made the building of large passenger ships somewhat difficult to say the least. 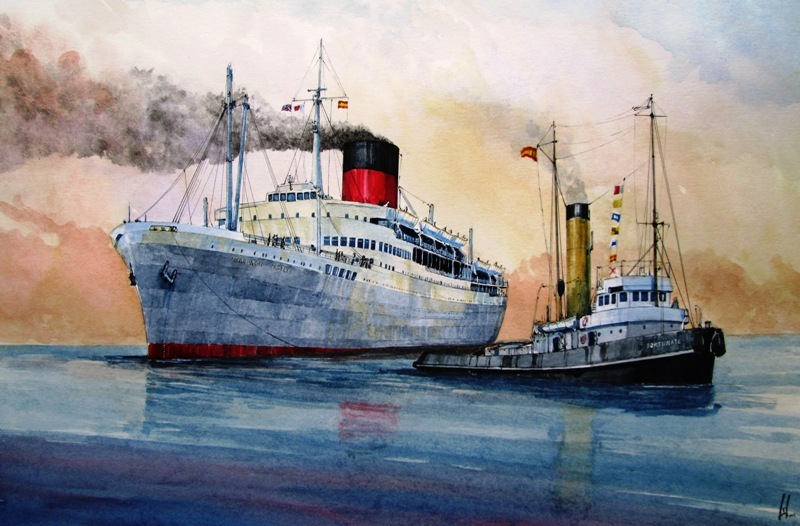 In order to make economies the design was very largely that of the "Capetown Castle" but instead of diesel power she would revert to steam turbines. From the outset there were problems with the decks of the "Edinburgh Castle" and her twin "Pretoria Castle". Unlike the old pre war vessels the decks of these two ships were sheathed in pitch pine instead of teak. To economise the planks were not 'fitted' but to allow for the lapped plating had filling pieces instead, it made the fitting out of the decks much easier and quicker as skilled carpenters were in short supply. The result of this was that from the very first voyage the decks started to weep rust as the steel beneath corroded, whenever possible red lead paint was pumped between the steel plates and wooden planking but it was never that successful and the two ships went through their life with rusting decks. 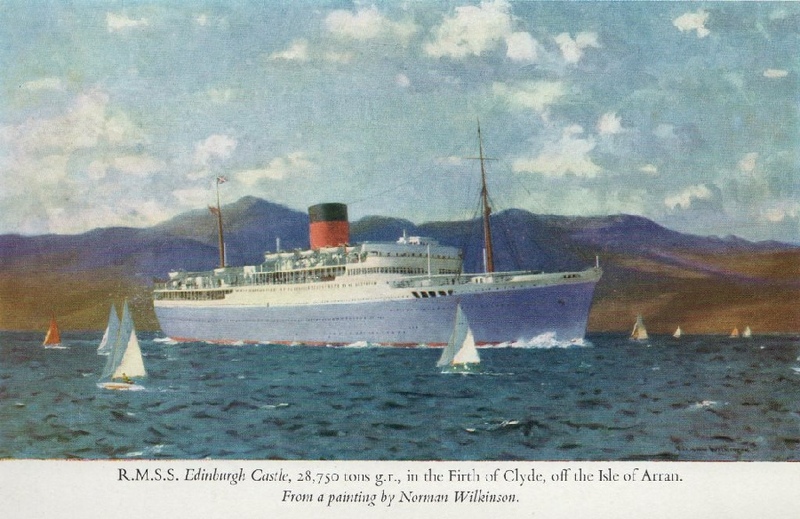 Because they were essentially 1930's design for the 1950's the ships went through a series of modernisations after the amalgamation with Clan Line. Outwardly the most noticeable change was with the mast arrangement but to the old U-C people the saddest change was in the colour scheme. The new Management did not like the old 'teak' brown masts and derricks and black winches, these became white and grey but a significant change was not easily noticed. 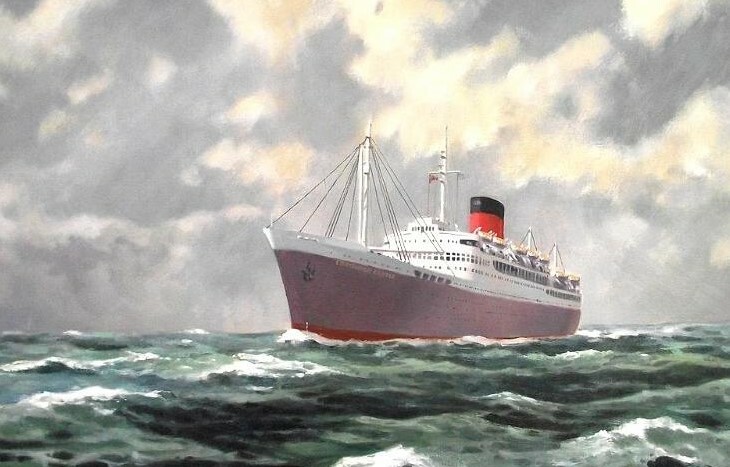 Between the lavender of the hull (officially described as 'London grey') and white superstructure was a two inch wide teak brown line right around the ship. Whilst not immediately noticeable when there it was more noticeable when not there. But it had been calculated that this line cost the Company £2000 per ship a year and that was in 1956, the more astute Clan Line management did away with the brown line! For tourist class passengers the most noticeable feature of the ships was the propellers vibration, new propellers were fitted for the accelerated service with the hull sandblasted and underwater plate laps filed to give a more streamlined underwater profile. With this the two ships were able to keep up the new mail service with their newer and faster sisters. Revelations Chapter 18 Verse 11. I was a serving deck officer with Blue Star Line and was in Capetown in in 1975. Whilst there the ‘Edinburgh Castle’ departed on her last pay off voyage. I remember the pennant she was flying and what a sad sight it was to see her sail off to the breakers. I took these photos of her leaving. Perhaps you might like to pass them on to your historical reunion group. I was on the ‘Halifax Star’ at the time of taking the photo. I very grateful for your contribution, I will add them to the Edinburgh's page on the B&C web site tomorrow and it will be uploaded tomorrow night. Are you sure this is Cape Town it looks very much like Durban to me. Edinburgh Castle was a great favourite of our, although I never sailed on her, I was always aware of her reputation as a very happy ship. My own favourite was Pendennis Castle and I served many many voyages on her as second officer, best job in the fleet!. Yes you are right, Durban it was. They certainly were great days to be at sea in the 70’s. 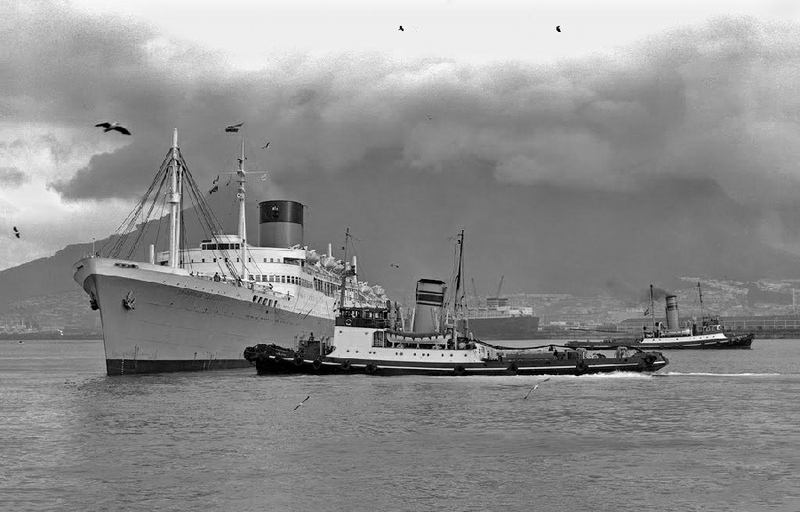 I was a cadet when I took this photo and had just gone right around the world on the ‘Halifax Star’ starting in Melbourne, then other Australian ports, then the east coast of the USA, them through the Med, Suez and were them down to Africa to load fruit for the UK. 6 months the trip took and it was fantastic. 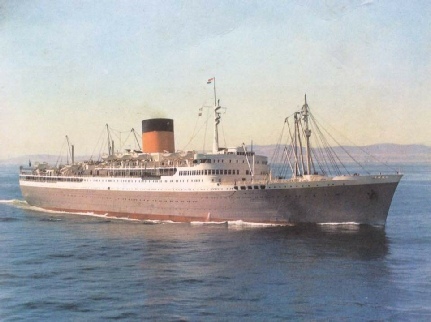 You are probably aware that Blue Star Line had a brief experience of the SA Mail run when Andalucia Star took the place of Pendennis Castle after she was withdrawn. You will find a picture of her in UC colours on the Pendennis Castle page. 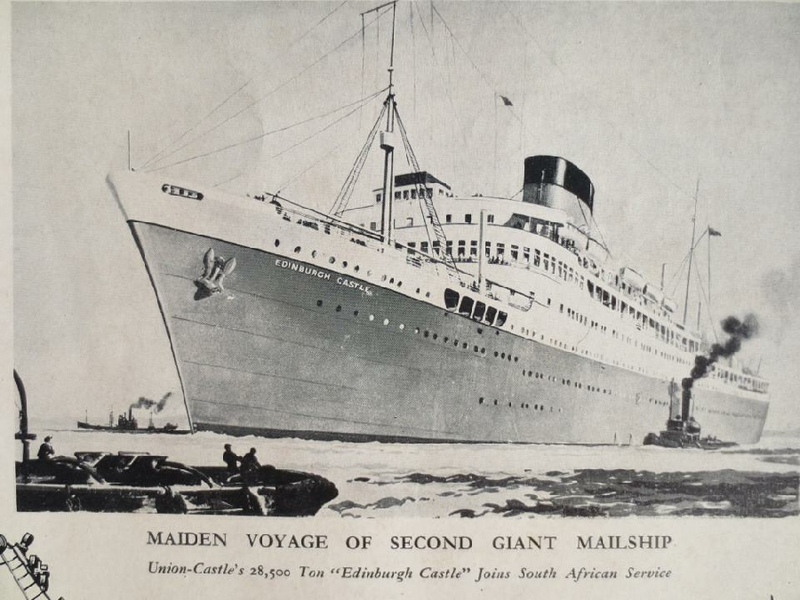 In 1956 the MCC cricket team sailed in Edinburgh Castle to tour South Africa. This was a fairly frequent occurrence on the mail ships. On this autographed postcard can be seen the signatures of: Cowdrey, Compton, May, Bailey, Wardle, Dexter, Laker and Duckworth (he of Duckworth/Lewis fame) as well as some others I cannot decipher.